The OnePlus team has skillfully built up hype for the OnePlus 5 and now we hear that the end is in sight - June 20. Wait, wasn’t the event scheduled for June 15? That's what previous report said, but it's difficult to be sure which date is real without confirmation from Pete Lau or Carl Pei, the leaders of the company. What Mr. Lau did say (on Weibo) is that the 5 will be the thinnest flagship (but not at the cost of user experience). Considering that the OnePlus 3T was 7.4mm thick, we’re looking at something even thinner. The company’s thinnest phone to date was the OnePlus X (6.9mm), though we’re not sure that counts - OnePlus is quick to forget the X ever existed. Anyway, even at 7.3mm it will be quite a challenge to to fit a 3,600mAh battery. It makes you wonder if the earlier 3,000mAh rumors are not closer to the truth. The Snapdragon 835 chipset has been officially confirmed (the only official spec so far), but Mr. Lau did also talk about reducing touch latency in an earlier post (without mentioning any of the chit-chat of QHD resolution). 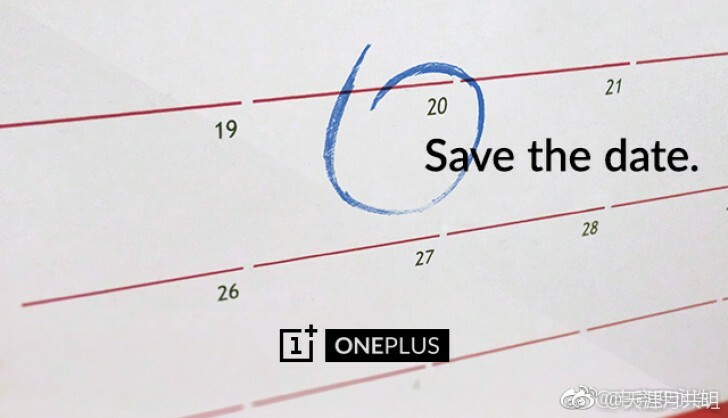 Circling back to the launch of the OnePlus 5, the Weibo rumor mill believes that sales will start within a week of the unveiling. Whether that’s a June 15 unveiling and a June 20 sale or a June 20 unveiling and a later sale remains to be seen. OnePlus 5 launching on June 20th 12 pm EDT (9:30 pm IST). Phones NOT need to be thinner, but I expect better cameras, batteries, maybe a screen like the Motorola X Force. The P10 is a current flagship. When he says the 1+5 will be the thinnest flagship, I believe he is talking about the current generation; so the 1+5 should be thinner than the P10 and other current flagships.